Looking back on that Memorial Day weekend two years ago, when he and his partners were meeting with Donald Trump at his gilded tower in Manhattan, North Shore businessman Lou DeCaprio said it was an opportunity neither he nor his partners had ever dreamed of. Neither was the partnership that resulted. But one year after working out a deal with Trump, DeCaprio said, his business has taken off. The businessman and television personality allowed DeCaprio to use his brand — that is, the Trump name — as the new moniker of the company, previously known as Ideal Health, a marketer of health care products. “We’re playing in a league of people where we must be the best at what we do,’’ said DeCaprio, a cofounder and president of the Trump Network. In just a year, the company has doubled its staff, to about 50, and recently moved into more spacious digs on the Newburyport Turnpike in Rowley. 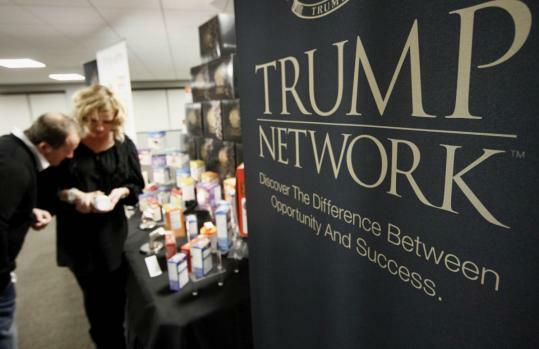 The Trump Network sells health care products such as diet plans, energy aids, and skin care through independent marketers, similar to the way Amway and Mary Kay operate. That sales force has swelled to 20,000 worldwide — up from 5,000 before Trump’s involvement. Revenue, according to the company, is approaching $40 million. Kathy Kelley, a founding member of the Network, said having Trump behind the business is drawing new sales people who would have never considered working with the firm before. “It really commands attention when they hear his name,’’ Kelley said. The Trump Network uses what is known as a network or multilevel-marketing strategy. Marketers, who also use the products, recommend them to others and then recruit those new customers to the sales team. The more a marketer sells and recruits, the more he or she earns. Trump said he has long been a fan of network marketing, so when a friend told him about Ideal Health, he decided to check out its founders, DeCaprio and brothers Todd and Scott Stanwood, and invited them to Trump Tower in New York. From that meeting Trump decided to put his name on the company, he said, and to make occasional appearances at Trump Network events. Trump and Trump Network executives did not disclose terms of their arrangement. Trump said he likes the Network’s skin care and weight loss products. Patrick Kaufmann, chairman of the marketing department at Boston University, said Trump’s decision to back a network marketing company — a first for him — probably stems from something of a “Why not?’’ attitude for someone of Trump’s standing. For sure, Kaufmann said, Trump’s charisma and name recognition will be a boon for the Network as it builds its business. And it is now the Trump Network in more ways than one. One of the company’s new marketers is Stephanie Castagnier, a contestant on Trump’s reality TV show, “The Apprentice,’’ whom he fired in a recent episode for not taking enough responsibility as a project manager.